12:54 a.m. – Following a motor vehicle stop on State Road Kevin A. Niles, 34, of 80 Bartlett Road was summonsed for operating vehicle without license. 10:12 a.m. – A dog found on Brave Boat Harbor Road was taken to creature comforts. 3:35 p.m. – Following a traffic stop on Walker Street Shaun-Michael D. Mills, 27, of 66 Roberts Street Unit PO16, Portland was arrested for operating while license suspended or revoked. 4:30 p.m. – Another agency was assisted. 5:34 p.m. – An animal complaint was received from Shapleigh Road. 7:59 p.m. – A burglary to motor vehicle was reported on Halstead Street. 8:42 p.m. – A single vehicle accident occurred on Valleys Road. 9:49 p.m. – An officer checked on suspicious activity they observed on Rogers Road. 1:00 p.m. – Officers assisted another agency on Woodlawn Ave.
2:16 p.m. – A report of disorderly conduct was received from Moore Street. 3:15 p.m. – An officer dealt with an animal complaint on Rogers Road. 3:35 p.m. – A motor vehicle accident occurred on Route 236. 5:12 p.m. – Another agency was assisted on Boush Street. 8:33 p.m. – Suspicious activity was investigated on Old Post Road. 10:35 p.m. – Following a report of a possible drunk driver on Route 236 Blanche Clara Hickman, 43, of 14 Debra Ave, Raymond, NH was arrested for operating under the influence. 10:46 p.m. – An officer checked on suspicious activity they observed on State Road. 1:17 a.m. – Scott L. Schrempf, 34, of 425 South Main Street, Bradford, MA was summonsed for operating vehicle without license. 3:05 a.m. – An Officer initiated a traffic stop on US Route One. 3:50 a.m. – Following a motor vehicle stop on the US Route One Bypass Russell Wayne Martin, 41, of 93401 Knappa Dock Road, Astoria, OR was summonsed for sale and use of drug paraphernalia. 8:45 a.m. – An alarm received from a business on Shapleigh Road was investigated and determined to be a false alarm. 1:06 p.m. – A citizen called to report criminal mischief on Cole Street. 1:59 p.m. – An alarm was received from Pepperrell Road. 3:15 p.m. – A resident came into the police department to speak to an officer regarding harassment. 3:30 p.m. – A motor vehicle accident involving two vehicles occurred on Manson Ave.
3:47 p.m. – An alarm was received from a location on Shapleigh Road. 5:02 p.m. – A dog was reported missing from a residence on Gailey Farm Lane. 5:49 p.m. – An alarm received from a business on Shapleigh Road was investigated and determined to be a false alarm. 7:06 p.m. – Following a traffic stop on US Route One Richard H. Murch, 4, of 15 Carrie Lane, York was summonsed for operating with suspended registration – tolls. 8:36 p.m. – A two vehicle motor vehicle accident occurred on US Route One. 4:08 a.m. – An alarm from a business on US Route One was found to be a false alarm. 6:49 a.m. – An alarm received from Pepperrell Road was investigated and determined to be a false alarm. 8:19 a.m. – An officer assisted the fire department on Thaxter Lane. 9:01 a.m. – Suspicious activity was investigated on Pettigrew Road. 1:05 p.m. – A resident reported harassment. 3:58 p.m. – Officers checked on reported suspicious activity on Wilson Road. 5:42 p.m. – A report was received of possible child neglect on US Route One. 9:28 p.m. – An alarm from a business on US Route One was investigated and found to be a false alarm. 11:24 p.m. – Following a traffic stop on Walker Street Joseph M. Merlina, 28, of 3 Bigelow Street, Lawrence, MA was arrested for unlawful possession of a scheduled drug. 2:24 a.m. – An officer checked on suspicious activity they observed on US Route One. 6:26 a.m. – An alarm from Stevenson Road was investigated and determined to be a false alarm. 9:51 p.m. – Matthew D. Golter, 35, of 6 Cutts Road Unit 11 was arrested for criminal trespass and refusing to submit to arrest or detention. 10:59 p.m. – A resident of Cutts Island Lane called to report suspicious activity. 5:34 p.m. – A call was received regarding a report of theft. 8:05 p.m. – Another agency was assisted on Cutts Road. 11:02 p.m. – Following a traffic stop on the US Route One Bypass Robert K. Lehmann, 53, of York, ME was arrested for operating under the influence, possession of marijuana, and sale and use of drug paraphernalia. 1:48 a.m. – An officer initiated a motor vehicle stop on the I-95 Freeway. 6:23 a.m. – A citizen found a flag on Dana Ave.
7:36 a.m. – An officer assisted the fire department on US Route One. 8:18 p.m. – An alarm from a business on US Route One was determined to be a false alarm. 8:42 a.m. – An alarm received from Shapleigh Road was investigated and found to be a false alarm. 9:29 a.m. – An alarm from Goodwin Road was found to be a false alarm. 9:48 p.m. – A resident came into the police department to report harassment. 12:56 p.m. – A motor vehicle accident involving two vehicles occurred on the US Route One Bypass. 2:13 p.m. – A caller reported a possible scam. 3:09 p.m. – Officers responded to US Route One for a three vehicle motor vehicle accident. 4:48 p.m. – Suspicious activity was investigated on Dennett Road. 7:20 p.m. – An officer responded to Cromwell Street for a report of suspicious activity. 7:58 p.m. – Following a traffic stop on US Route One Sima R. Patel, 23, of 85 US Route One Bypass was summonsed for operating with suspended registration. 9:54 p.m. – An alarm from a business on US Route One was determined to be a false alarm. 6:30 a.m. – Another agency was assisted on Rogers Road. 9:23 a.m. – A report of ID theft was received. 3:12 p.m. – Officers responded to the US Route One Bypass for a disturbance. 4:20 p.m. – Assistance was given to another agency. 5:07 p.m. – Following a motor vehicle stop on Rogers Road Jamie C. Perron, 42, of 23 Cromwell Street was summonsed for failure to register vehicle. 6:20 p.m. – Another agency was assisted. 8:11 p.m. – A dog was reported missing from a residence in South Berwick. 6:57 a.m. – An alarm received from a business on Dexter Lane was investigated and determined to be a false alarm. 6:11 p.m. – An officer assisted another agency in the area of Dennett Road. 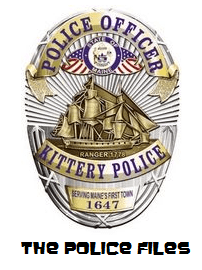 9:25 p.m. – An animal complaint was received from Halstead Street. 11:46 p.m. – A caller reported a domestic issue. 7:05 a.m. – A resident of Norton Road called with an animal complaint. The animal was gone upon the officer’s arrival. 8:59 a.m. – Another agency was assisted on Tilton Ave.
10:44 a.m. – A theft was investigated on Lewis Road. 1:23 p.m. – Suspicious activity was reported on Hartley Farm Lane. 3:08 p.m. – An officer served paperwork on Shapleigh Road. 3:17 p.m. – Paperwork was served on Pepperrell Road. 3:48 p.m. – Officers responded to Old Post Road for a report of disorderly conduct. 5:54 p.m. – Paperwork was served on Tilton Ave.
8:35 p.m. – An officer served paperwork on Tilton Ave.
9:30 p.m. – An officer checked on suspicious activity they observed on the I-95 Freeway. 9:51 p.m. – An alarm received from a business on US Route One was found to be a false alarm. 10:13 p.m. – Officers responded to the area of Stevenson Road and Shade Tree Lane for a report of suspicious activity. 11:00 p.m. – An alarm from a location on US Route One was investigated and found to be a false alarm. 1:13 a.m. – A call was received regarding suspicious activity on US Route One. 7:50 a.m. – An animal complaint was reported on Brave Boat Harbor Road. 8:02 a.m. – A two vehicle motor vehicle accident occurred on Shapleigh Road. 11:24 a.m. – Officers responded to Boush Street for a report of disorderly conduct. 2:55 p.m. – Another agency was assisted on Government Street. 5:13 p.m. – Suspicious activity was reported on Cole Street. 9:36 p.m. – An animal complaint was received from Eliot Road. 9:41 p.m. – A citizen called to report phone harassment. 9:54 p.m. – Following a traffic stop at the intersection of Route 236 and Stevenson Road Daniel Kelsall, 24, of 424 Rollins Road, Rollinsford, NH was summonsed for possession of marijuana and sale and use of drug paraphernalia. 10:24 p.m. – Paperwork was served on Old Post Road. 11:20 p.m. – Mark Andrew Stretton, 51, of 28 Oak Ter was arrested on a warrant. 12:49 a.m. – An article was found in the intersection of Wilson Road and US Route One. 4:42 a.m. – A noise complaint on Route 236 was investigated and determined to be unfounded. 9:45 a.m. – An officer assisted with a civil issue on Old Post Road. 11:11 a.m. – An officer checked on a suspicious vehicle they observed on Haley Road. 12:47 p.m. – Paperwork was served to a subject at the police department. 1:09 p.m. – A violation of a protection order was investigated. 7:51 p.m. – A citizen came into the police department to turn in a license they found on Walker Ave.
9:13 p.m. – Joshua Thomas Sayahi, 25, of 314 North Berwick Road, Wells was summonsed for failing to give correct name, address, or date of birth and arrested on another agency’s warrant. 11:10 p.m. – A report was received of suspicious activity on Philbrick Ave.
11:28 p.m. – A noise complaint was received from a resident on Rogers Road. 11:42 p.m. – Following a report of a possible drunk driver on the I-95 Freeway Megan Beliveau, 28, of 1620 Greenland Road, Portsmouth, NH was arrested for unlawful possession of a scheduled drug and Cherie H. Smith, 30, of 6 Cutts Road, Unit #57 was summonsed for possession of marijuana. 7:48 a.m. – An animal complaint was received from Cutts Road. 10:24 a.m. – Following a call from Pleasant Street David J. Pratt, 21, of 41 Government Street was summonsed for criminal mischief. 2:00 p.m. – A report of suspicious activity on US Route One was reported. The subjects were gone upon the officer’s arrival. 2:19 p.m. – Following a motor vehicle stop on Manson Ave Jason A. Johnson, 29, of 12 Cross Street was summonsed for failure to register vehicle. 2:52 p.m. – A report of theft from a location on US Route One was investigated. 5:18 p.m. – A vehicle verse deer accident occurred on Wilson Road. 8:55 a.m. – An animal complaint was received from Armour Drive. 11:02 a.m. – A citizen came into the police department to report the theft of a cell phone. 12:02 p.m. – An officer checked on a dog left in a vehicle on US Route One. 1:49 p.m. – An officer checked on suspicious activity at the intersection of Whipple Road and Williams Ave.
9:19 p.m. – An alarm from a business on Badgers Island West was investigated and determined to be a false alarm. 10:41 p.m. – An officer initiated a traffic stop on State Road. As a result, two subjects were arrested and a third was issued a summons. Jerrid James Giddings, 39, of 329 Main Street, Unit #2, Nashua, NH was arrested for unlawful trafficking in scheduled Z drugs. Melanie Ann Kanarian, 44, of 16 Granite Street, Nashua, NH was arrested of unlawful possession of scheduled drug. David Martin, 37, of 39 Forge Drive, Nashua, NH was summonsed for sale and use of drug paraphernalia and possession of marijuana. 9:31 a.m. – Paperwork was served on US Route One. 10:39 a.m. – A stray dog was found on Captains Way. 12:01 p.m. – Suspicious activity was investigated on Rogers Road. 3:19 p.m. – A hunting violation was reported on Haley Road. 3:34 p.m. – A dog was reported lost from a residence on Barters Creek Road. 3:46 p.m. – A motor vehicle accident that involved three vehicles occurred on US Route One. This entry was posted in General Town News on November 14, 2014 by Chuck Denault.